It’s no secret that the Romney campaign believed it was headed for victory on Election Day. A handful of outlets have reported that Team Romney’s internal polling showed North Carolina, Florida, and Virginia moving safely into his column and that it put him ahead in a few other swing states. When combined with Ohio, where the internal polling had him close, Romney was on track to secure all the electoral votes he needed to win the White House. The confidence in these numbers was such that Romney even passed on writing a concession speech, at least before the crotchety assignment-desk known as “reality” finally weighed in. Less well-known, however, are the details of the polls that led Romney to believe he was so close to the presidency. Which other swing states did Romney believe he was leading in, and by how much? What did they tell him about where to spend his final hours of campaigning? Why was his team so sanguine about its own polling, even though it often parted company with the publicly available data? In an exclusive to The New Republic, a Romney aide has provided the campaign’s final internal polling numbers for six key states, along with additional breakdowns of the data, which the aide obtained from the campaign’s chief pollster, Neil Newhouse. Newhouse himself then discussed the numbers with TNR. Together, New Hampshire, Colorado, and Iowa go most of the way toward explaining why the Romney campaign believed it was so well-positioned. When combined with North Carolina, Florida, and Virginia—the trio of states the Romney campaign assumed were largely in the bag—Romney would bank 267 electoral votes, only three shy of the magic number. Furthermore, according to Newhouse, the campaign’s final internal polls had Romney down a mere two points in Ohio—a state that would have put him comfortably over the top—and Team Romney generally believed it had momentum in the final few days of the race. (You see hints of this momentum when you compare the Saturday numbers in each state with the Sunday numbers. Romney gains in five out of the six states, though Newhouse cautions not to make too much of this since the numbers can bounce around wildly on any given day.) While none of this should have been grounds for the sublime optimism that leads you to eschew a concession speech—two points is still a ton to make up in a state like Ohio in 48 hours—you see how the campaign might conclude that the pieces were falling into place. Wisconsin, Pennsylvania, and Minnesota are also of interest. Although internal campaign numbers for these states are much closer to the actual results than they are in the other three states (and very close to the final public polls), they at the very least reflect a flaw in the campaign’s assumption that undecided voters would break Romney’s way. If the internal polls are correct, roughly 80 percent of undecided voters actually broke toward Obama. That aside, the numbers also explain why Romney decided to visit Pennsylvania on Election Day rather than, say, Wisconsin (both states that could have put him over 270 electoral votes had he failed to win Ohio). 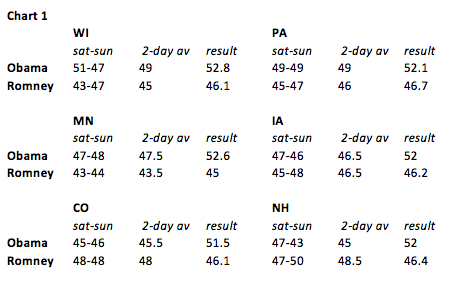 Pennsylvania, in addition to being a state that neither candidate had spent much time or money in (meaning there would presumably be a higher return on a candidate visit there), actually looked more winnable for Romney than Wisconsin in the final hours of the race. This point can be overstated. For example, New Hampshire and Iowa are both predominantly white states, and Obama won both whites and older voters in each of them. Likewise, whatever the challenges of polling Latinos, they were only 14 percent of the electorate in Colorado. It would be a stretch to say they explain most of the error in a Romney poll that was off by 8 percentage points overall in the state. What’s striking is how much better Romney does among those with the greatest interest in the campaign. If you look at Colorado and New Hampshire in particular, Romney is running up big margins among even the 8-10s, which Newhouse said routinely accounted for 80-90 percent of the sample in his internal polling. (In New Hampshire, the 8-10s represented 88 percent of the sample.) Newhouse said the reason the campaign broke out these numbers is that it helped them “try to gauge intensity.” But it also led them astray—it led them to assume that voter intensity was driving Romney’s leads. And it reflected a flaw in their polls. The people who told the campaign they were 8s, 9s, or 10s were a smaller share of the November 6 electorate than the 80-90 percent they accounted for in Romney’s polls--partly because Newhouse and his colleagues underestimated the number of young people, African Americans, and Latinos who wound up voting. The second big problem with Romney’s internal polls has to do with the supposed momentum I alluded to earlier. Newhouse told me his numbers showed Romney stalling out around the time of Hurricane Sandy the week before the election, then recovering in the final few days of the race. “We thought we had in the last 72 hours of campaign … made up some ground from the challenging messaging period during the hurricane,” he said. It was the kind of momentum that could have made Ohio look doable even though Romney’s internal poll showed him down two points over the weekend. With the wind at their backs, even Pennsylvania may have seemed realistic with a three-point deficit Sunday night. In some cases, the momentum appeared to be rather stark. Newhouse told me that the poll the campaign took in New Hampshire on Thursday, November 1, showed Romney down 45-48. On Sunday, it showed him up 50-43—a ten-point swing. New Hampshire turned out to be an especially volatile state, as Newhouse mentioned. And even without that, numbers often jump around arbitrarily on any given day. “You rule out any huge movement. It just doesn’t work that way,” said Newhouse. But, he conceded, “You begin to think maybe there is some movement” in the face of these kinds of numbers. “We had good earned media.” Indeed, even if you take two-day averages, Romney was down 1.5 points in New Hampshire after Thursday’s poll, according to Newhouse, but up 3.5 after Sunday’s poll—a five-point uptick from the post-Sandy low-point. In retrospect, of course, there wasn’t any momentum to speak of, at least not toward Romney. How is it that Newhouse’s polls detected momentum nonetheless? One Democratic pollster I spoke with offered the following theory: During the final days of this campaign, only the most loyal partisans were picking up their phones when pollsters called—everyone else seemed to have had enough. (The pollster notes that this isn’t a general feature of campaigns; it just happened to be true of this one.) That would have exaggerated the influence of partisans generally. And if, on top of that, your poll already skewed toward Romney, then it would have amplified the Republican partisans even more than the Democratic ones and produced the appearance of momentum. Newhouse rejected the theory when I suggested it. “There’s no evidence to indicate that’s true, that only partisans pick up the phone [late in the campaign],” he said, adding, “I’d argue we didn’t have much of a house effect [i.e., unexplained skew].” When pressed on why many of his final numbers showed an erroneous uptick for Romney, he offered that “it may be a function of Sunday polling”—a valid concern given that many pollsters are wary of polling on weekends. Author's note: Special thanks to TNR's Nate Cohn for his exceptionally valuable insights. Any mistakes here are my own, and almost certainly because I didn't follow a piece of his advice. Update: Credit where due: CNN's Peter Hamby had a similar (if less detailed) set of numbers in his well-done report the day after the election. Apologies for the oversight.